Rechargeable battery delivers up to 10 hours of run time. The CHAUVET DJ EZbar is a battery-powered light bar with three independent warm white LED pin spots. It’s ideal for highlighting event space elements such as a wedding cake, works of art or even architectural details. Each spotlight has a narrow 5° for very precise lighting. The possibilities for the EZbar are endless, limited only by your creativity. Each of the EZbar’s three lights can be manually adjusted to different angles to illuminate a variety of subjects. This compact fixture has a run time of up to 10 hours, thanks to its rechargeable lithium battery. Multiple EZbar lights can be connected together with the built-in hardware. M10 and M12 threaded inserts let you safely mount the fixture to truss. Combine EZbar with the CHAUVET DJ Scissor clip to mount to air wall tracks or drop ceilings. The included IRC-6 wireless remote lets you turn the EZbar LED on or off, and set the dimmer precisely. 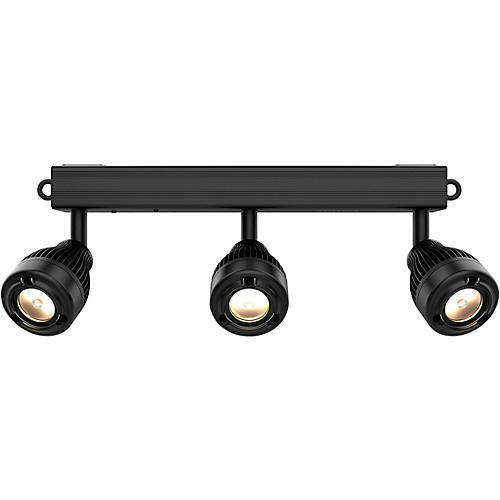 The included diffusers adapt the fixture to wide angle and short-throw applications. Experience total wireless freedom—order today.